Single Cup Coffee, makers of Keurig®-compatible single serve coffee cups, has announced that its Torani line of coffees, including Salted Caramel and Coconut Macaroon, have won Rogers Media’s Canadian Product of the Year award. 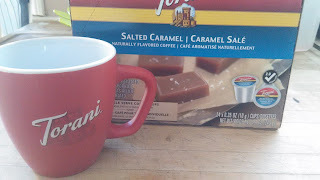 Winning in the K-Cup® category, Torani Salted Caramel and Torani Coconut Macaroon Coffees are made with 100% Arabica coffee beans, expertly roasted with the same care and craftsmanship that goes in to all Torani products. Product of the Year™ is the world’s largest consumer-voted award for product innovation and currently operates in 40 countries with the same goal: to guide consumers to the most innovative products in their market and reward the entrants for quality and innovation. “Torani has been a world leader in creating some of the best tasting and highest quality flavour syrups for more than 90 years and we are excited that our single serve coffee has been selected as the best in Canada,” said Melanie Dulbecco, CEO of Torani. Made with only the finest ingredients and with a focus on quality and handcrafted care, Torani single cup coffees are created using natural flavours paired with rich medium bodied coffees. All Torani products are compatible with Keurig and Keurig 2.0 brewers and other K-Cup-type single serve coffee brewers. The Product of the Year is judged by a jury comprised of industry experts who select the finalists that meet the Product of the Year standards of value and innovation. Those selected finalists are categorized and judged through an online survey of 7,000 Canadian consumers, conducted by Rogers Consumer Insights group. Consumers vote and select the winning products they feel are most worthy of both the Product of the Year Canada title and the distinct internationally renowned red seal. Single Cup Coffee and its products are not affiliated with Keurig, Inc. Since 1925, the experts at Torani have been committed to crafting real flavour using carefully sourced, high quality ingredients to ensure the best taste. From its humble beginnings in San Francisco’s North Beach neighborhood, the family-owned company has grown to become the most popular consumer brand of flavoured syrups in North America. Sold at retailers, online and proudly served in cafés and restaurants around the world, Torani continues to stay on the creative edge with flavourful new products and ideas. For more information, visit www.Torani.com. Single Cup Coffee is a distributor of innovative single serve beverage solutions that bring consumers access to new, exciting brands and refreshment choices. By forging partnerships with brands consumers love, we create specialty quality, and better-for-you beverage choices. All our beverages are compatible with most single serve brewing systems, including Keurig® 2.0 brewers. Our products are available across Canada and the United States. For more information, visit www.SingleCC.com.